Biscayne Beach Residences will always have a special place in our portfolio. It was our first major building project in Florida. This was our initial opportunity to make our mark in the Southeast market. Initially, the project ran smoothly until one of the trades was not able to install all of the hollow metal doorframes. That led the General Contractor to reach out to our team with the assignment of installing all of the hollow metal doorframes in the common areas for the entire building. Quickly, we provided the additional crew necessary to handle this task without any issue; all installations passed inspection the first time. Two wood staircases had to be built, and completely out of fire rated wood which prompted our purchasing department to locate and place a last minute order for this specialized type of lumber. Our master carpenter worked tirelessly to design, deliver and install both stairs at the penthouses. The stairs were ready just in time and passed the first inspection. 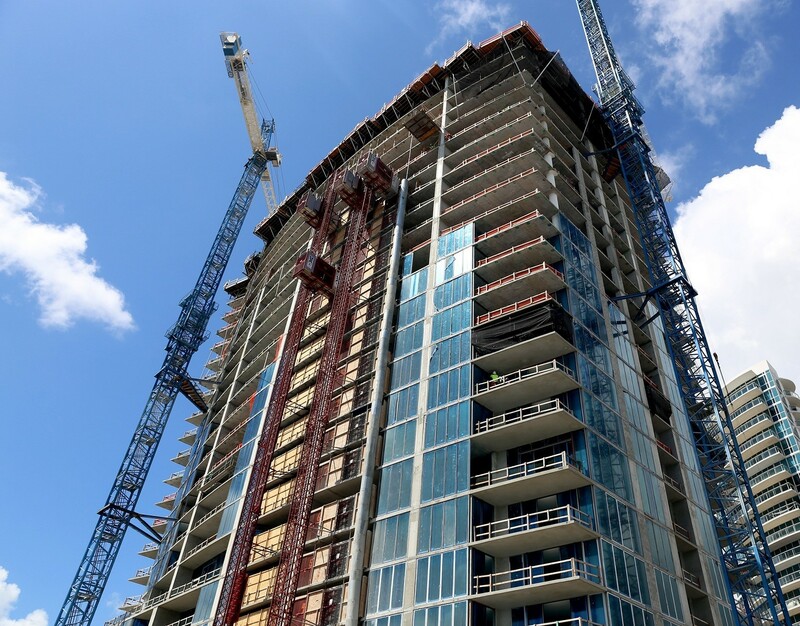 Our team provides unique safety solutions in practically every situation, passing inspections the first time and delivering on schedule is our key to successfully doing business, especially in the highly competitive, Florida market. TSC Southeast is the preferred, turn-key provider of construction safety solutions in South Florida. Biscayne Beach is Miami’s first man-made beach condo complex, offering 399 residences of 10-foot ceilings, 8-foot terraces, floor-to-ceiling windows, and vast panoramic views of the ocean in each unit. Interiors were design by the brilliant Thomas Felicia, with each residence commanding a bold and confident feel that buyers seek, while maintaining the warm and comforting atmosphere essential to any home. Two Roads Development was the developer for this project and sets the standard in luxury housing by selecting the most prestigious multi-family and residential communities for their portfolio of projects that boast the best location, architecture, amenities and services in the industry. It was a pleasure to perform this scope of work for this renown firm.